In July, the Japanese Atomic Energy Agency (JAEA) and F4E signed the Procurement Arrangement (PA) for the Toroidal Field (TF) magnet for the JT-60SA project, one of the three projects covered by the Broader Approach Agreement between Europe and Japan. Representing approximately 40% of Europe’s hardware contribution to the project, the PA opens the way for the procurement of a component key to holding the tokamak plasma in place. 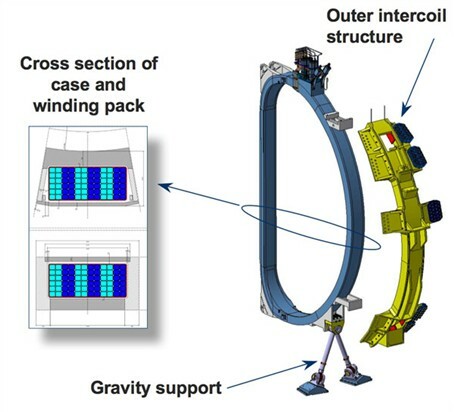 It foresees the manufacture of the NbTi coil conductor and power supply feeder connections, 18 TF coils, each consisting of a conductor winding pack and steel case, intercoil structures to resist the overturning forces on the TF coils due to the nearby strong poloidal field, and 18 gravity supports to take the combined weight of the above. It defines the requirements and interfaces for design, fabrication, works tests, and transport to the port of entry in Japan, and for works acceptance of the TF coils by the JT-60SA project. The work will be carried out, for their respective parts, by contractors chosen by F4E, as well as by the Voluntary Contributors CEA (French Atomic Energy and Alternative Energies Commission) and ENEA (Italian National Agency for New Technologies, Energy and Sustainable Economic Development). Delivery of the first TF coil is foreseen in October 2013.